Tutte le opere di Santa Maria Maddalena de' Pazzi, dai manoscritti originali. Catholic Church, Mysticism, Carmelite nuns, Carmelite nuns -- Italy -- Florence -- Correspondence, Christian women saints, Christian women saints -- Italy -- Correspondence, Correspondence, De' Pazzi, Maria Maddalena, -- Saint, -- 1566-1607 -- Correspondence, De' Pazzi, Maria Maddalena, -- Saint, -- 1566-1607., Internet Archive Wishlist, Mysticism -- Catholic Church -- Early works to 1800., Spiritual life -- Catholic Church -- Early works to 1800. 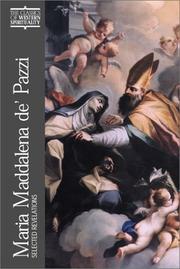 Are you sure you want to remove De' Pazzi, Maria Maddalena Saint from your list?